This is a unique book. Firstly, the subject, as far as I am aware, has never been written about before. Secondly it has been a lengthy labour of love by Brother Reuben Thomas and will probably be his only book. Brother Reuben uses as his basis for the history, the Adelaide Ecclesial baptismal register up to 1950. There are records from the Goolwa Ecclesia and the Broken Hill Ecclesia amongst others. Also personal letters and interviews add to the history. Chapter 1 is a brief history of the work of Brother John Thomas and Brother Robert Roberts in bringing into being a body of people known as Christadelphians. Chapter 2 is the start of the Christadelphian Ecclesia in South Australia. It was at Goolwa where the Kennetts and the Mansfields were amongst the first baptised believers. As with the first century ecclesias, this was a home based meeting of likeminded searchers for truth. The first baptism was in late 1879 or early 1880. Chapter 3 is the history of the Adelaide Ecclesia, starting around 1885. Brethren Horace Farrell, John Hopkins and George Parsons and families met in their respective homes. Brother James Ellis was the first baptism recorded in the Adelaide Ecclesia. The group were soon joined by Brother James Mansfield senior and family, who moved up from Goolwa. On February 20th, 1887, the first Cobbledick family member was baptised. Three various premises were hired for use until the Ecclesia built their own hall at Halifax Street which opened in 31st December, 1927. Brother Reuben’s history finishes before the establishment of Woodville Ecclesia (1952) and Cumberland Ecclesia (1955). Chapter 4 is entitled ‘Country Ecclesias’ and includes a large section on Broken Hill where the ecclesia’s history was intimately linked to the mining history of the town. Broken Hill was the ecclesia from which the Dangerfields, Broadbridges and Lunds, amongst others, came. 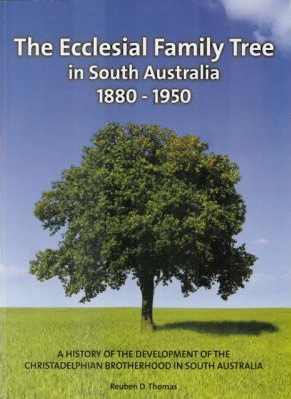 The history of the Glenlock Ecclesia is also there, with the Mallee and the Penola Ecclesias. Chapter 5 narrates additional ecclesial activities during that period. The long list of committees and classes show how the ecclesia was the centre of religious and social activity for its members. Chapter 6 records details of brethren and sisters from 1878 to 1950. What a mine of information! Highlights include Sister Minnie Moyle Maidment Aufder-heide – who was baptised twice. And there are the splendid names of the Wigzell boys: Eugene Earnest, Wilbur Winston, Alta Ascelin, Lucian Lloyd and Cleon Caedmon. What imagination mum and dad demonstrated! Chapter 7 is 50 pages of historical pictures. I am sure someone in your family has a relative there. To conclude there are 9 appendices looking at early brethren and sisters, the history of Goolwa, letters from Brother and Sister R. Roberts and the history of Broken Hill. Overall this is a very interesting book for anyone with an interest in Christadelphian history. The perfect gift for a dad or grandma and you will probably enjoy reading it yourself. This article was written by Paul Duke. Published in Vol. 20, No. 3 of The Lampstand, printed May - June, 2014, and uploaded online March 30, 2015 .